As I lay in bed last night, I listened to the rain come and go and wondered what the day might bring. Overall, it was, if not sunny, at least it was brighter. We continued to have periods of rain showers, most of which were heavy. However they only lasted 10-15 minutes at a time – sometimes even shorter periods. The thing was that the sunshine only lasted that long as well, so there was never an opportunity to take off my waterproofs. Each time I tried, it would start to rain again! I did get very good at figuring out how to vent my rain paints to allow some breeze to blow onto my legs once in a while. When the rain did come, it was often accompanied by cold blowing winds. So, hood on and jacket zipped all the way up, then hood off and jacket unzipped. Rinse and repeat, so to speak. As we left Appleby, we walked through the train station, saying good-bye to Allison and Adrian, the British couple of our group. We will be sad not have them on the trail with us. We walked out of town along roads and then along lanes and did make it back into the pastures. This particular pasture was very wet and very muddy. We had to leap over a water filled ditch and crawl under low tree branches all while avoiding large swampy areas of water and lots of mud. As we walked out of this area we came across a huge flock of ducks. I figured they would fly away as we walked toward them, but all they did was waddle through the fence into the neighboring fields until we walked past. Once we reached road again, we decided to detour around the next area of field to try to avoid the mud and we stayed on the road. The detour took us to the same town, and was the same distance to walk, just drier. We did get to see a beautiful Norman Church that was open to visitors by going on the detour. 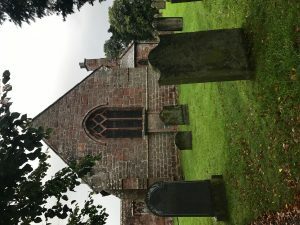 The church was at Long Marton, and was built in 1100AD. Not only still standing, but also being used for daily communion and church services. It was beautiful, although small inside. The baptismal font inside was from the 18th century. The grave markers outside were quite large – the earliest ones I noticed were from the 1600s, but I didnt walk the entire yard so there might have been some older ones. Leaving Long Marton, we walked some more established tracks, passing by small farms and homes, heading toward Kirkby Thore. At one point, a couple of geese decided we were too close to their territory and came running at us, honking and chortling at us. Fortunately, there was a gate and fence between us and them, but it didnt stop them from reaching their heads between the slats to try to peck us. We walked through cow fields, and field has a beautiful mare who mostly ignored us, but did come up to me once I stopped walking and stood quietly for her. She was a beautiful, gentle horse. Leaving this field, we walked through a double kissing gate – the first one I have seen. Kissing gates are much easier to get through than climbing over stiles, but you do have to watch how you maneuver when you have a backpack on. In Kirkby Thore, we stopped at a small convenience store and bought ice cream cones, and mom and I found Eccles cakes to have for lunch tomorrow. Leaving Kirkby Thore, we again walked through the pastures, eventually coming back to the River Eden. We followed the rivers edge for a couple of miles, through pastures with plenty of cows (who largely ignored us), even seeing a couple of swans. From the river, it was only about a mile into Tower Sowerby and to the Kings Arms Hotel where we are staying for the night. Once showered, clothes rinsed out and hung to dry, I headed back out into town to find the only geocache in the area! Tonight, we will eat at the hotel we are staying at as it is the only pub in town! After lashing rain showers (pouring rain) during the night, we woke to blue and sunny skies. Instead of having my usual eggs and bacon for breakfast, I took the opportunity to have eggs Benedict – made me think of my friend Lydia. The hollandaise sauce was velvety and rich. It was so nice to start out not having to wear our waterproofs! It was still a bit cool, so I started walking with light jacket, wool hat and gloves on, but as the sun warmed us, these items soon came off. The rain held off until the afternoon, when we had several showers rain down on us. As every other day, as soon as we stopped for lunch and got all our food out the rains started. One crazy thing about this weather – when the sun is out, there is little to no wind. As the rains start, the wind comes with them and the temperature drops about 10 degrees. This is why jackets get zipped and unzipped, taken on and off, hats on, hats off, etc. As we left Temple Sowerby today, we walked through a couple of fields before coming to Acorn Bank Garden and Watermill is a National Trust Property. In 1228 it was the site of a religious house of the Knights Templar, on their suppression it passed to the Knights of the hospital of St John who held it from 1323 until the Dissolution. In 1543 it became the property of the Dalsotn family. Parts to eh house date fromt eh 16th century, but the main block was rebuilt in the 17th century. The whole house was then given a new facade with Georgian sash window in the 1740s. From that time, the house changed hands several times, finally given to teh Nation Trust in 1950 by Dorothy Una Radcliffe. The first mention of the watermill at Acorn Bank was made in 1323. Although primarily a corn mill the mill has also been used to provide power to teh Estate’s Gypsum mines. The mill ceased to work in the 1940s. 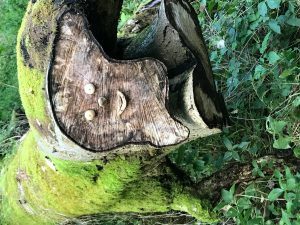 As our trail wound through the grounds, we found faces on cut tree limbs, wooden games, lean-tos, tepees and play houses in the woods. We left the grounds of Acorn Bank and walked along a small river, passing under the Crowdundle viaduct. Crossing another pasture, we ended up on a small road. As we were walking along, we were overtaken by a small herd of young cows being taken up the lane to their farm. They were not too happy about passing a group of hikers! At the top of the road, we picked up another footpath that was more of a lane that led to more fields to cross. We had some “excitement” crossing some of these fields where the farmers had set up electric fences to keep their cattle out of certain areas – but it was across where we needed to walk. Dad had a “stop, drop and roll” technique, whereas most of us just crawled under on our hands and knees. The path led us into the village of Culgaith. The gardens in the front yards of the houses were beautiful, and some even had apple trees in the front yards. Walking through Culgaith, we missed our turn off onto the foot path and had to backtrack just a little ways. It was a very, very narrow stile to climb and the footpath itself was just one person wide between a shrub row and a stone wall. This path led through a horse farm. These horses were well pampered – there was an “exercise wheel” (for lack of a better term). It is a round building with four “stalls” that rotated, causing the horses to walk in continuous circles while is is on. There were two horses being exercise in this manner. As we walked between the paddocks, a couple of the horses ran up to us to be pet – and probably to see if we had anything in our pockets for them. Leaving Culgaith, we had more road walking, then track walking. Mom and dad found a bench where the had to provide us some “entertainment” since we hadn’t seen any since the younger couple two days ago! It was also along this road that we stopped for a bite of lunch, encountering more rain. After lunch, we walked into Langwathby, a small village. From here, we detoured off the trail to cross over the River Eden, and walk through more fields to get to our accomodations in Edenhall. Along the way, we came across a children’s park where Mom and Verna had a go on the swings. We arrived at the hotel before our luggage did! This hotel offered to dry our boots for us (something we look forward to having – dry boots) and even do some laundry for us. We will be eating at the hotel again tonight, then to bed early for a 13 mile day tomorrow.